Guide books report where to find those “little out of the way shops” and blogs tell you the latest “trendy” spots to get a bargain. But by the time the guide books are published and the blogs are posted, everyone has discovered the boutiques and the bargains are gone. So what to do when you’re shopping in Paris, or Houston, or Shanghai? Get out of the malls and out of the shopping centers. Avoid Pandora’s Box! I have a friend who collects decorative boxes. Although I don’t always find one for her, searching for a box has been the key to finding many other treasures. 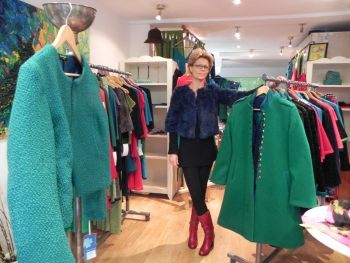 Wandering the streets of Paris, I looked in all kinds of shop windows for a box; next to an antique shop, I discovered fashion designer Anna Fjord. Her clothing is custom-made of beautiful fabrics and reasonably priced for a unique design in Paris. I bought a dress … but no box. A new restaurant opened on Rue Chappe, and its window was decorated with pillows, baskets and painted boxes. 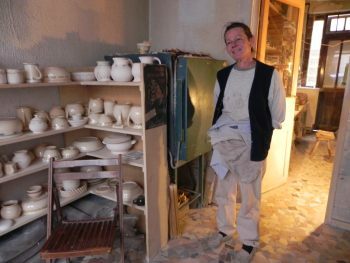 Adjacent to the restaurant, I found a potter who displayed pitchers, cups and bowls in a functional setting with one bare light bulb. Marie Caloz proclaims herself from the Jurassic Age; she has no television, no computer, no Website, although she did get a cell phone six months ago for emergencies. I bought a couple of pieces of pottery for gifts … but no box. We saw a street-fair that certainly wasn’t a sidewalk sale! Vendors had Cristofle silver, Lancel handbags, Baccarat and Lalique glass. I was careful not to touch anything for fear of decimating the crystal AND my bank account! And there I found it, nestled among the silk foulards … the perfect box! I bought a scarf AND the box! My friend Deb Evans is a handbag freak – she LOVES purses, bags and satchels. I knew that was what I wanted to buy for her in Paris, but I wanted it to be unique. Over the course of the two months, I saw several women carrying handbags that I admired. Finally, I gathered my courage and asked for help from a woman walking in Montmartre. “Votre sac est tres agreable. Pourriez-vous me dire ou vous l’avez achete?” Your handbag is very nice. Would you mind telling me where you bought it? “Je voudrais acheter un sac simulaire pour une amie aux Etats-Unis.” I would like to buy one for a friend in the US. Not only did she tell me where she purchased the bag, she took me into the nearby store and introduced me to the owner! Of course I bought one! When is a Bargain … a Bargain? When you pay what you’re willing to pay! I used to enjoy bargaining for the lowest price in Sicily and Mexico, but I’ve become too lazy. We try to buy one antique liqueur glass from each country when we travel – just one, special individual glass, not a set. Like searching for the box, we have a good time searching for the perfect glass. 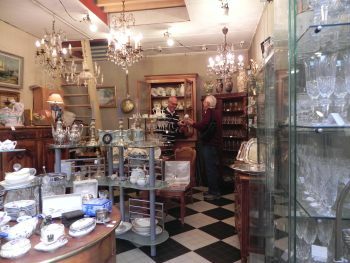 We were in Marche Aux Puces, once a flea market but now with an upscale antique area, and discovered a signed Baccarat glass. It was marked 80 Euro; I was willing to pay 40. Instead of starting at 20 Euro, and negotiating up while the vendor negotiated down, I decided to experiment with an alternative technique learned from a friend who took me to the gold Souk in Dubai. I waited until no one else was in the shop, so the vendor and I could speak privately. I looked at several glasses, appearing to consider less expensive options, none of which I really wanted; I kept returning to the heaviest cut, and most expensive, piece, but my reluctant body language made it “obvious” that the less expensive ones were in my budget. Finally, I asked “Qu’est-ce que le plus bas prix que vous accepterez de celui-ci?” What is your lowest price? He looked at me for a moment, then replied, “Quarante Euro” – 40 Euro. Just as we purchased the gold bracelet for half price in Dubai by looking at other options and asking for the lowest price, we paid what we wanted to pay for the glass in Paris. Maybe I could have paid less, but maybe not. If nothing else, I bought less frustration for myself and more time to do additional shopping! And, as the gift-giving season approaches, have fun finding the unusual! I LOVE my bag and I couldn’t have found one as perfect as the one you found! I’m delighted you can speak French so well and were so well taken care of in Paris.